Get free food and snacks plus pizza and sub BOGOS as chain restaurants and fast food places celebrate Tax Day on Monday, April 15, 2019. Check out our roundup below for all the details and make Tax Day as painless as possible. Check back later as more deals are expected. BurgerFi has cheeseburgers for $4.15 with an app coupon good today, Monday, April 15, 2019. To get the deal, good only on Tax Day, open the BurgerFi app and find the special in your BurgerFi rewards. Then order a BurgerFi Cheeseburge and scan your code at the register. 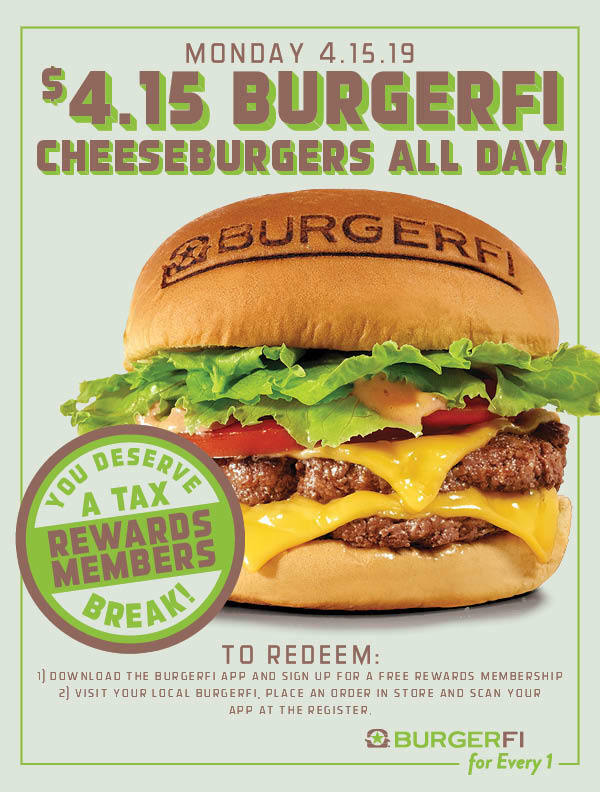 For more details see the BurgerFi Tax Day announcement. You can download the BurgerFi app and sign up for a BurgerFi rewards account at: https://burgerfi.com/rewards. *Offer valid 4/15/2019 only at participating BurgerFi locations. Must be a member of the BurgerFi Rewards program to redeem. Offer valid on in-store purchases only and includes (1) BurgerFi Cheeseburger, double-patty only (Offer excludes all other sandwiches and hot dogs). One redemption (1) per app user. Cannot be combined with any other offer or special. No Substitutions. In-store orders only; offer not valid on in-app, website, phone or delivery orders. Scan your app at the register for discount to be applied. ©BurgerFi International LLC 2019. Charlie Brown’s Fresh Grill has up to $15 off to mark Tax Day. Get $10 off a $40 food purchase or $15 off $50. Show your server the Charlie Brown’s Facebook Announcement to get the Tax Day discount. 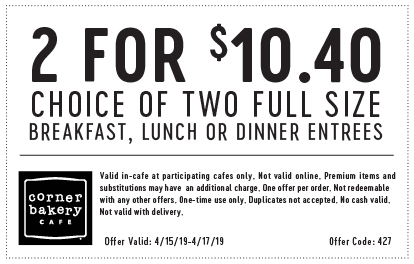 Corner Bakery is offering two breakfast, lunch or dinner entrees for $10.40 with a Tax Day coupon good today, Monday, April 15, 2019. CLICK HERE for your Corner Bakery coupon. Get two full-size entrees for $10.40 with the coupon, good April 15-17, 2019. Lunch/Dinner coupon is valid on for two full size pasta, panini, salad, or sandwich entrees. Breakfast coupon is valid on two full size scrambler, panini, or sandwich entrees. Valid at participating locations only. Good for in-cafe purchases only; not valid with online ordering. Corner Bakery announced the Tax Day special in This Email. Cotton Patch has 20% off or a free appetizer with these Tax Day coupons good today through Monday, April 15, 2019. 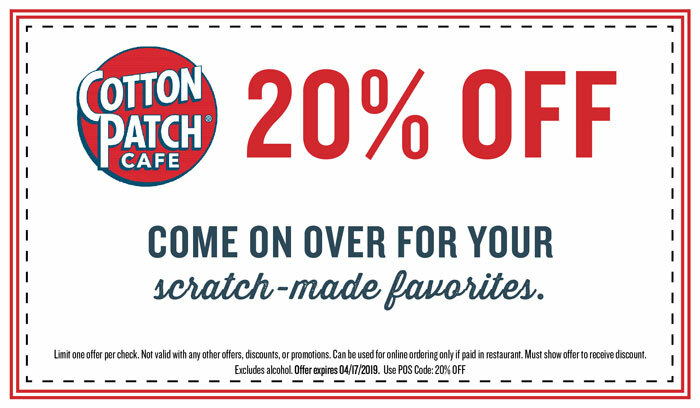 Get 20% off an online order with THIS Cotton Patch Coupon. 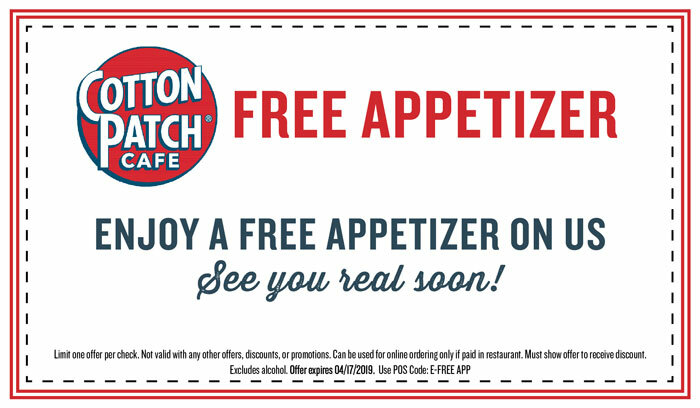 Or get a free appetizer with THIS Cotton Patch coupon. Cotton Patch announced the Tax Day specials in This Email. Dunkin has a $1 coffee special for rewards members on Tax Day. DD Perks Rewards Members can get a medium Hot or Iced Coffee for $1 all day at participating Dunkin’ restaurants nationwide by paying with an enrolled Dunkin’ gift card or scanning their DD Perks loyalty ID QR code. Dunkin announced the special on their News Page. 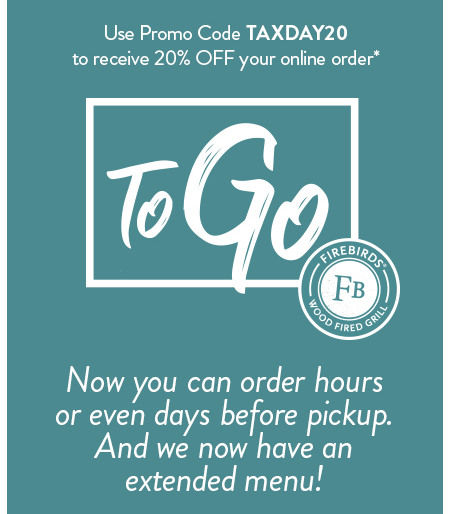 Firebirds Wood Fired Grill has 20% off online orders with a Tax Day promo good on April 15, 2019. Enter promo code TAXDAY20 and get 20% off food items. You can start an online order at: Firebirds Online Orders. *Save 20% on food orders placed online on April 15, 2019. *Must use Promo Code TAXDAY20. Bonus Cards not valid with online ordering. Does not include restaurant weeks or promotional menu items. Firebirds announced the Tax Day special in This Email. Firehouse Subs has a buy one sub, get one free deal. 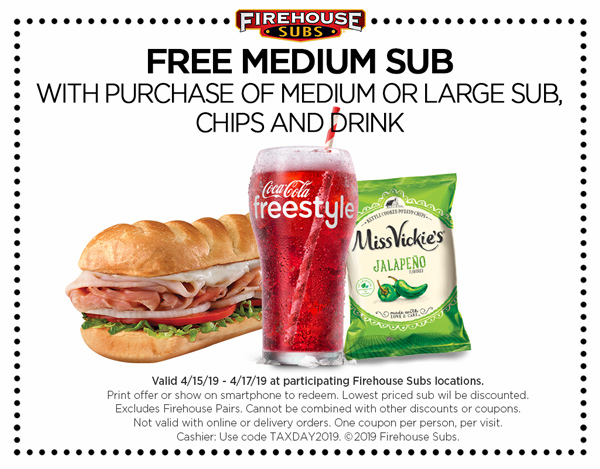 You’ll need This Firehouse Subs Coupon to get the deal. Good for one free medium sub when you buy a medium or large sub, chips and drink at regular price. The coupon is good April 15-17, 2019. Firehouse announced the Tax Day special in This Email and on Facebook. Come in April 15th from 7-10 AM and enjoy a Free Sausage Biscuit.Just say “Made From Scratch”. HoneyBaked Ham has this Tax Day coupon: Get a Ham Classic Sandwich for $4.15. CLICK HERE for your HoneyBaked ham sandwich coupon. Good for a Ham Classic Sandwich for $4.15. $5 off any bone-in half ham or whole boneless ham, or get any two heat and serve sides for $15.99, or get any three heat and serve sides for $22.99. Coupons valid only at participating locations. Not valid online. The chain announced the Tax Day special in This Email. Hot Dog on a Stick has a free Turkey or Veggie Dog for customers on Tax Day. To get the freebie ask for the Tax Day Facebook special. You can find the Hot Dog on a Stick announcement on Facebook. Papa John’s is giving a free pizza to rewards members who spend $20 or more on April 15, 2019.Papa John’s Pizza announced that rewards members who spend $20 or more today will get a FREE Large 2-topping pizza deposited into their account the next day. The special is good for one day only, on Monday, April 15, 2019. Papa John’s announced the Tax Day promo on Facebook. 2. Score FREE Pizza. The day after your qualifying purchase, your free pizza will be in “My Offers” on your Papa Rewards page. 3. Redeem. Click on the FREE Pizza offer in your Papa Rewards Account to customize your free large 2-topping pizza and add it to your cart. You can redeem through 4/28/19. For more details see the Papa Johns Free Pizza Page. To redeem this Perk, pay with your Potbelly Perks account online or by scanning your app in shop. Potbelly announced the BOGO on Facebook. *Buy any sandwich and get one (of equal or lesser value) for free. 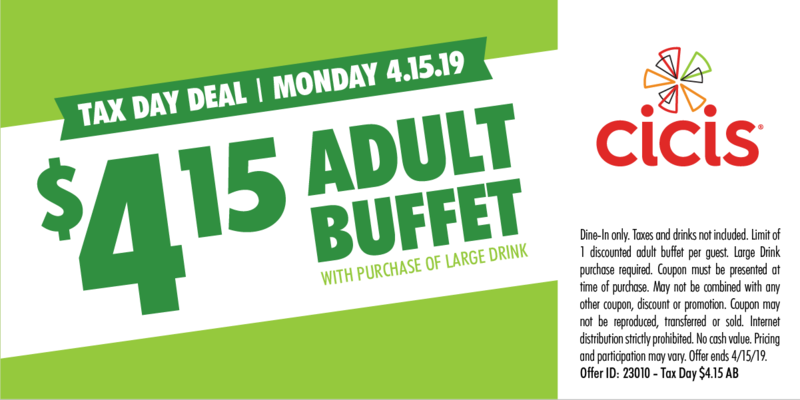 Valid only on Monday, April 15, 2019. One free sandwich per customer. Must be redeemed in the same transaction. You can download the Potbelly App for iOS app here or Android app here. Ra Sushi has $10.40 off a check for $30 or more on Tax Day. The chain announced the Tax Day special on Facebook. Schlotzsky’s has free Original Sandwiches with purchase of a medium drink and chips on Tax Day. Schlotzsky’s announced the Tax Day special on Facebook. Stop by on Monday, April 15th and get a FREE small Original sandwich when you buy a medium drink and chips. Texas de Brazil has $10.40 off dinner for up to 12 guests with this coupon good on Tax Day. CLICK HERE for your Texas de Brazil coupon. Show to your server to get $10.40 off a regular priced dinner. Valid for up to 12 guests per table. Tijuana Flats has burritos for $5 to mark Tax Day. “Celebrate the end of Tax Season and treat yourself to a $5 burrito. $1 extra for steak,” the chain said in their Facebook announcement. *Excludes Megajuana and specialty burritos. Valid in-store and online. Not valid with any other offer or promotion. The Tex-Mex chain announced the Tax Day deal on Facebook. Regular price for burritos is about $7. World of Beer has burgers with a side for $5 to $6 on Tax Day. Price and participation may vary. To get the special, show you server the World of Beer announcement on Facebook. Zinburger has draft beer and wine glasses for half off on Tax Day. Good at select locations. Zinburger announced the Tax Day special in This Email. *Not valid in Arizona, Atlanta Lenox Square or Durham. Must be 21 and over to purchase and consume alcohol. Half-price glasses of wine and draft beer available on April 15th only. This offer cannot be combined with any other offer or discount. Dine-in only. See server for details. In the United States, Tax Day is a colloquial term for the day on which individual income tax returns are due to the federal government. The term may also refer to the same day for states, even where the tax return due date is a different day. Since 1955, for those living in the United States, Tax Day has typically fallen on April 15. For those filing a U.S. tax return but living outside the United States and Puerto Rico, Tax Day has typically fallen on June 15, due to the two-month automatic extension granted to filers by IRS Publication 54. Due to Emancipation Day in Washington, D.C. (observed on the weekday closest to April 16), when April 15 falls on a Friday, tax returns are due the following Monday; when April 15 falls on a Saturday or Sunday, tax returns are due the following Tuesday.